Following 8 years of active involvement in shaping the digital ecosystem of Greece and the online placement of the country’s hotels, Nelios, a leading Greek hotel digital marketing company, has decided to expand its reach beyond borders, intensifying its efforts in securing international collaborations. 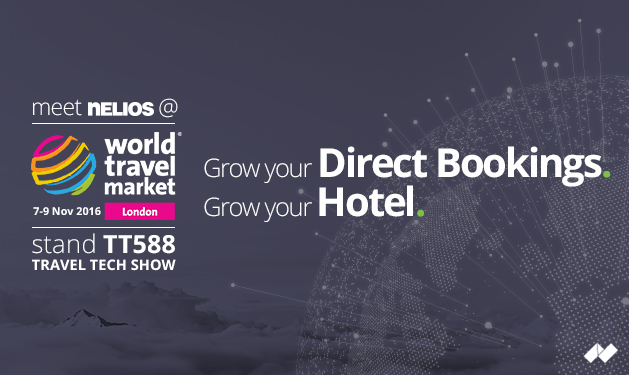 The preparations for the company’s first official presence at World Travel Market (WTM) London, taking place November 7 – 9, are well underway and the CEO of Nelios, Dimitris Serifis, talks to the Greek Travel Pages (GTP) about his strategic decision to go global. GTP: What factors are behind Nelios’ decision to launch this new era, which is expected to include activities of global outreach? Dimitris Serifis: Strengthening our efforts in order to engage new partnerships abroad stems from the maturity that has now been achieved within the company, both at expertise level and also in terms of our procedures and personnel. We have the experience of working with several hotels in Greece across all categories and types, we have an excellent, skillful personnel team, we implement cutting-edge technologies and we have worked with clients in 5 different countries in the last 5 years. Also, our main product, which is the increase in our clients’ direct online bookings, has been this year’s most talked about topic in the field of hotel sales worldwide and is in great demand. Nelios was the first company in Greece that set its focus towards the increase of direct bookings, foreseeing the significance of this path for both the profitability and growth of each hotel. This creates an excellent framework for Nelios to also succeed abroad. GTP: Is there something that concerns or perhaps troubles you, regarding this new step that Nelios is about to take? Dimitris Serifis: It is a new beginning and that, of course, means there is some skepticism but there is also great enthusiasm at the same time. As I have already said, we launch this new era with strong foundations to face all the challenges that may come our way. The most important thing for us is that we are 100% sure of the quality of our services. The investment needed to attend this type of exhibition is significant, therefore you must be certain that you can stand your ground at such an international level. Furthermore, we feel great confidence after 3 years of specialising in the hotel sector and after having achieved important results for our clientele. GTP: What do you believe to be the key turning point of Nelios’ development, since its establishment until now? Dimitris Serifis: There have been many elements that collectively contributed to the company’s development, as I have already mentioned. I, however, would single out two: the first one is Nelios’ verticalization in the hotel sector, 3 years ago. This decision became the starting point for attaining deep knowledge and expertise, which are both elements that led to a significant upgrade in our services. The second is the business choice to work with hotels and accommodations of all types and categories. This exposed us to a wide range of different needs for which we had to provide optimised solutions. This challenge provided us with the necessary and valuable experience in the nuances of the industry. GTP: Earlier, you referred to ‘direct bookings’. What is it that a hotelier must do in order to gain bookings directly from their own channels, such as the hotel’s website? Dimitris Serifis: A prerequisite of this, is the hotelier’s willingness to shift resources and strengthen the efforts in all sales channels, so as to drive more reservations through the website. We are therefore referring to adopting a new concept, that requires a specific strategy plan in order to take its final shape and come to benefit the hotel. GTP: What is your opinion on the level of services supplied by digital marketing agencies in Greece? Dimitris Serifis: In many digital agencies within Greece, the level of the quality of services is sufficiently high. In actual fact, following the 12 years that I have been involved in the field, I can assure you that Greek agencies have made great improvements and have nothing to fear compared to agencies abroad. Specifically within the hotel industry, I think that the level in Greece is higher than many developed countries. It is an element that has also helped our own development, and Nelios overall. GTP: What are your goals regarding WTM London 2016? Dimitris Serifis: Sales, and expanding our brand awareness at an international level. GTP: Will Nelios’ attendance as an exhibitor at the World Travel Market in London be its only participation at international exhibitions or should more be expected? Dimitris Serifis: Clearly there will be more participations. We are currently devising a concrete, business extroversion plan, of which our WTM attendance is just the beginning, while the plan’s final form will take place in the following weeks to come. In order to reinforce brand awareness either at a local or international level, a single participation in one exhibition is not enough. It requires a plan, continuity and consistency, and of course it requires that all the structural foundations in the background are ready to cover the demand that emanates from such activities, with absolute professionalism.